Puglia, also known as Apulia, is in the south of Italy; the heel of Italy's boot. The region is not one of Italy's traditional tourist destinations, but it is becoming increasingly popular as travellers discover the area's varied charms: baroque towns, white-washed trullo houses, olive groves and orchards, blue sea and beaches, plenty of sunshine and excellent cuisine. The region is divided into six provinces: Bari (which is the regional capital), Brindisi, Foggia, Lecce, Taranto and the recently-constituted province of Barletta-Andria-Trani. 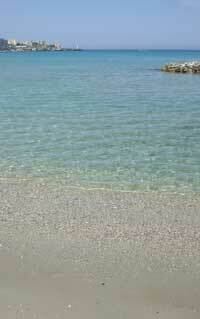 The area around Lecce and the southernmost tip of the 'heel' is called the Salento. Puglia borders the regions of Campania, Molise and Basilicata. Basilicata's most famous site, the cave-town of Matera, is close to the Puglia border and makes a good addition to a tour in this region. Almost always ruled by outsiders, Puglia was a primarily feudal farming region, and its character today still reflects its relatively humble agricultural past. The most glorious time for Puglia was probably the centuries when Greek colonists established cities in southern Italy. There's not much to see now in Puglia of the towns of Magna Graecia, but the pottery from the period ('Apulian ware') survives in museums here and around the world. The Romans established important ports here which served the Empire; the Appian Way which starts in Rome finishes in Brindisi, its end still marked by one surviving Roman column (its twin is now in Lecce). The next period to have left a bold impression on Puglia's landscape was the Middle Ages, when grand churches were built in Puglia's distinctive version of Romanesque style, with added elements influenced by the area's commerce with the East. In the thirteenth century Puglia was ruled by the 'Wonder of the World', the Holy Roman Emperor Frederick II, who built a string of castles through the region which are still among its most notable sights. Like the rest of southern Italy, the region has endured difficult decades and saw a lot of emigration as Pugliesi headed north or abroad to seek their fortune. Nowadays, although the poorer quarters of the cities still have bad reputations, it feels a fairly comfortable and settled place to the traveller. Investment in industry and development means that the areas around Puglia's big ports, Bari, Brindisi and Taranto, are dominated by ugly industry and brutal modern residential tower blocks and building sites, but away from these eyesores there are vast tracts of attractive countryside. 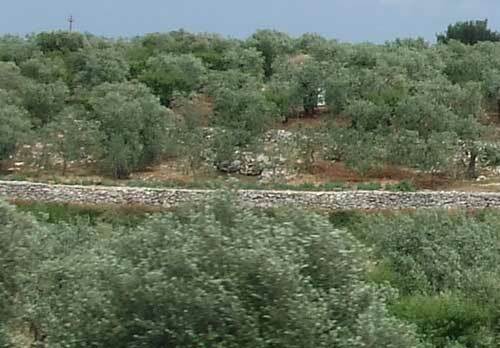 Much of the region's interior is covered by olive groves, interspersed with orchards and other crops. If you have only seen small olive groves before, the endless 'forests' of olive trees come as a surprising sight. 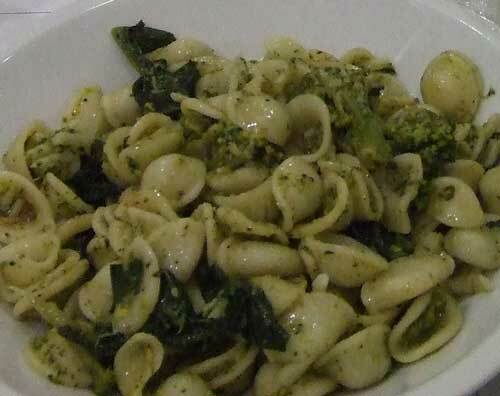 Although the area is dry with low rainfall, the Pugliesi grow large quantities of fruit and vegetables, and their cuisine is rich in local products like beans, chicory and broccoli. For many travellers, Puglia is a departure point for Greece, Albania and the former Yugoslavia, with ferries crossing the Adriatic from Bari and Brindisi. For others it is an entry point to Italy, and in the past the region has had problems coping with an influx of illegal immigrants. Nowadays there is a new (and more welcome) wave of arrivals: holiday-makers and 'good-lifers' attracted to the sunny climate, the coastline and the countryside. With an increasing amount of attention from Italy-loving outsiders, the area is setting itself up on the tourist trail. There are many new and upgraded hotels, holiday apartments and B&Bs. One of the most popular types of tourism is masseria accommodation. Masserie were the big houses at the centre of large agricultural estates: now they frequently offer comfortable rural accommodation, often with extras such as spas and cookery courses. Ryanair offer budget flights from London Stansted to Bari Airport (called Palese Airport). From the airport there is a local bus service into the centre of Bari, and there is also a more expensive airport shuttle bus which runs straight to the railway station. Puglia has another international airport at Brindisi, called Brindisi Casale. This too is connected by bus to the centre of town. The airport is close to a great tourist attraction: the frescoed Basilica di Santa Maria del Casale. From Brindisi Airport there is also a fast coach service to Lecce, which runs several times a day and stops just outside the centre of Lecce. Most visitors hire cars to make it easy to travel around Puglia and visit smaller destinations. Although they do generally return with at least one story of getting terribly lost, this is quite a practical way to travel and means you can stop where you choose. But take a good road map and ask directions when in doubt. Some of the more remote sights - and particularly beaches - are not well-connected by public transport; bus services are scanty and it can be difficult to find information about public transport. However, it is worth persevering with research, as it is entirely possible to see the region's best sights without needing to hire a car. On our Puglia pages we provide information on reaching our featured destinations by public transport, and on car-free excursions. The little railway lines run by FSE (Ferrovie Sud Est) are one of the most scenic ways to view the countryside, and link together some of Puglia's top tourist towns including Alberobello, Lecce and Otranto. There is another private railway line to the north of Bari, and one crossing the border into Basilicata, connecting Bari with the cave-town of Matera. In addition there are national FS train services which connect most of the major towns with the rest of the Italy. Puglia's most striking tourist attraction - because it is so unique - is the trulli district, around Alberobello (a UNESCO World Heritage site). 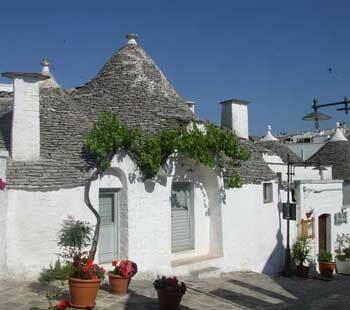 A trullo is a simple dry-stone-walled building with a domed roof topped by a cone. They are dotted around the green Valle d'Itria, and in Alberobello the town's large clusters of white-washed trulli create an unusual and memorable scene. 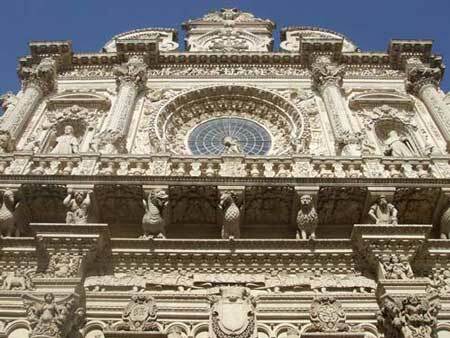 Also striking, in a more sophisticated style, is Lecce, a town famed for its baroque beauty: all golden stone and elegant seventeenth-century architecture with riots of cherubs and foliage. On the whole, the smaller towns of Puglia, and the countryside, make better holiday destinations than the big port cities. Martina Franca, Locorotondo, Cisternino and Ostuni are all picturesque hilltop towns scattered around the Valle d'Itria. Along the coast, Otranto is one of the most attractive seaside resorts, with a picturesque old town and blue waters. Around Taranto there are fascinating underground sanctuaries and churches, while at Castellana Grotte, close to Alberobello, there are impressive natural caverns offering guided tours. The small Tremiti islands are busy destinations for daytrippers enjoying holidays on the wooded Gargano peninsula - a national park with rocky shores, and a popular holiday destination. The Salento area is another popular choice for summer holidays: it is the peninsula making up the lowest part of the heel of Italy's boot. Many Catholic pilgrims head for San Giovanni Rotondo, the site associated with Padre Pio - the bearded modern saint you'll see depicted on mountains of cheap religious kitsch all around Italy. Among other religious sites are the Church of St. Nicholas (Basilica di San Nicola) in Bari, where the remains of 'Santa Claus' (stolen from Turkey by the enterprising Baresi) lie in state in the crypt. For a different kind of pilgrimage, film lovers may be interested in a side-trip to Castellaneta, the birthplace of Rudolph Valentino. If you are touring with a car you'll be able to visit the intriguing castles of Frederick II, including the enigmatic octagonal Castel del Monte, another World Heritage site. Puglia is still developing as a tourist destination and it doesn't have the experience, resources or dynamism of Italy's more famous tourist areas to the north. English is not widely spoken at anything more than a basic level, and some aspects of accommodation and service are a long way from north-European expectations. Unlike Rome or Venice, for example, you may find it hard to obtain a drink of English tea without detailed explanations - carry your own teabags if this is important to you. We'd strongly recommend you prepare for your trip by reading up on the area and learning a few phrases of Italian - or at least taking a phrase book with you. If you are exploring the area independently, it's worth doing some research on travel and opening hours before you set off. Tourist information offices have limited opening hours and few resources other than town maps. On our Puglia pages we'll provide as much practical information and advice as we can, along with links to useful websites. We found it invaluable to have printed out railway timetables in advance - often we were better equipped with information than the people/offices where we made enquiries. Be aware that in the south of Italy, almost everything shuts up for lunch (churches close at noon, shops sometimes later) and doesn't re-open for hours. Town centres are deserted and most attractions, businesses and tourist information offices are closed. On a hot summer afternoon the sensible thing to do is to take things easy. By 4 or 5pm the towns begin to come back to life, with shops opening again until late, and families joining in the ritual evening stroll, the passeggiata. We encountered many very helpful people - train staff, members of the public, shop staff - and just a few who lacked the will or the initiative to help (often those who were paid to do so). Where something seemed unclear - street directions, how to get to a specific railway platform - there was always someone to explain or to help. Asking questions and chatting usually led to a very warm response. So take a guide book, read our pages, make some notes, print timetables, and travel with a relaxed and open attitude. > Puglia & Matera - a suggested travel itinerary using public transport to tour Puglia, with a side-trip to Matera. Despite the awakening of an international tourist industry, city hotels in Puglia still tend to be old-fashioned, uninspiring and over-priced. A newer wave of alternative accommodation offers more interest and better value: from masserie in the countryside to holiday trulli in Alberobello. A lot of new B&Bs have opened - in Lecce they are a particular feature - and if you read reviews carefully you can find some good places to stay. When travelling around Puglia, I took the Lonely Planet guide to Puglia and Basilicata . Since the two regions logically combine together for a touring holiday, it's a useful area to cover. The freshness of the publication meant that most prices and practical information were still correct, and the small town maps were extremely useful when arriving in a new place. The information was reasonably thorough and well-researched, and although we did have other resources too, this would make a good stand-alone guide for exploring the area. The weak points were the Italian and proof-reading - some mis-uses of Italian in the book indicated that the writers were not that well-acquainted with the country or language. Although public transport information was included and was generally accurate, there was a strong sense that these researchers had been to Puglia, toured once in a car and then written up their experience - perhaps not unreasonable but if you're used to the guides to more popular destinations, you'll miss the thoroughness and authority earned after years steeped in a culture. Some opening hours and practical details were sketchy - admittedly this is an area where information is hard to come by. Don't rely on any guidebook totally; be prepared for some changes and double-check important information when you arrive. The emphasis on driving can be unfortunate - a beach which sounds as though it is just outside central Gallipoli is actually several miles away. Overall though, this is still a good guidebook to carry around. In addition to a guidebook, we'd suggest buying a good map of the area - essential if you're driving - and a phrase book or dictionary. The Touring Club Italiano regional maps are good and are the ones we use: Puglia (Carte Regionali) - from Amazon.co.uk .